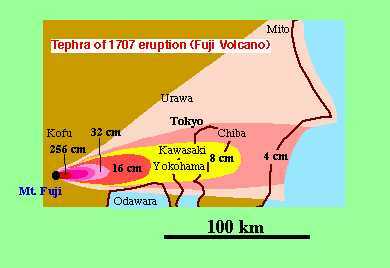 (LEFT) Tephra from Fuji Volcano in 1707 (Hoei eruption)--Based on Miyaji (1988). The latest eruption of Fuji Volcano (3,776 m in altitude; the HIGHEST in Japan) occurred in 1707. 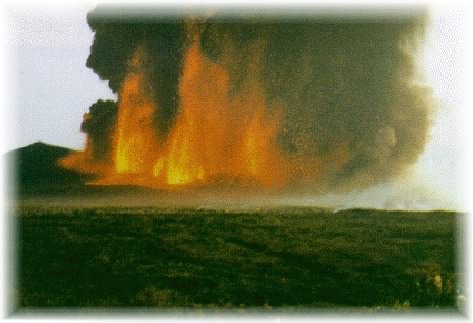 The magnitude of this eruption was "FIVE" as VEI (Volcanic Explosivity Index, proposed by Newhall and Shelf, 1982). According to "Volcanoes of the World" (2nd ed.) 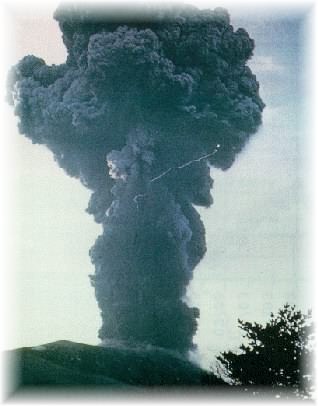 by Simkin and Siebert (1994), Japan has not experienced eruptions as large as VEI=5 during these 300 years, except for this eruption and the Tarumai (Shikotsu) 1739 eruption! Their list shows that about 2% of eruptions in the world was "FIVE" and larger. These 200 years, 15 large explosive eruptions (VEI=5-7) occurred outside Japan. 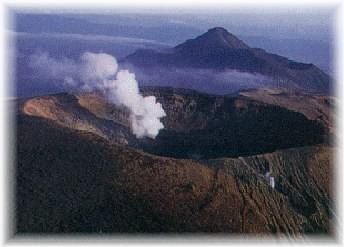 The Japanese island-arc has 83 active volcanoes; reaching about 10% in the world. Several eruptions occur here every year. We should prepare against approaching large eruptions in Japan, including Fuji and Tarumai volcanoes, though the researches for long-period prediction of volcanic eruption just started. Go to Fuji Volcano of VRC. Unzen dome on 19 May 1995--taken by S. Nakada. This volcano stopped its eruption in February 1995. 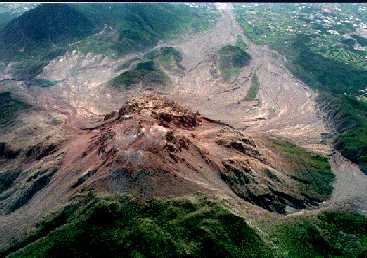 This photo shows the western view of lava dome and pyroclastic flow deposits extensively distributed around it. Go to decade volcanoes for more detail. Copyright (C) Volcano Research Center, ERI, Univ. TOKYO, All rights reserved. No part of this document may be reproduced, copied, distributed, transferred, modified, or transmitted, in any form or by any means, without the prior written permission of the center.